Come visit our NEW Interactive Discovery Room for tons of FUN! The Discovery Room features two large aquariums, all new engaging exhibits and a 30-foot interactive screen where guests can virtually immerse themselves in woodland habitats and seasons, learn fun facts about wildlife and play a variety of games – competing to be the top lizard in a push-up challenge; jumping as high as a frog to catch dinner; or posing for a woodpecker selfie and MORE! The environmental stewardship area of the Discovery Room will inspire guests to take action to keep our waters clean, pick up litter and recycle. 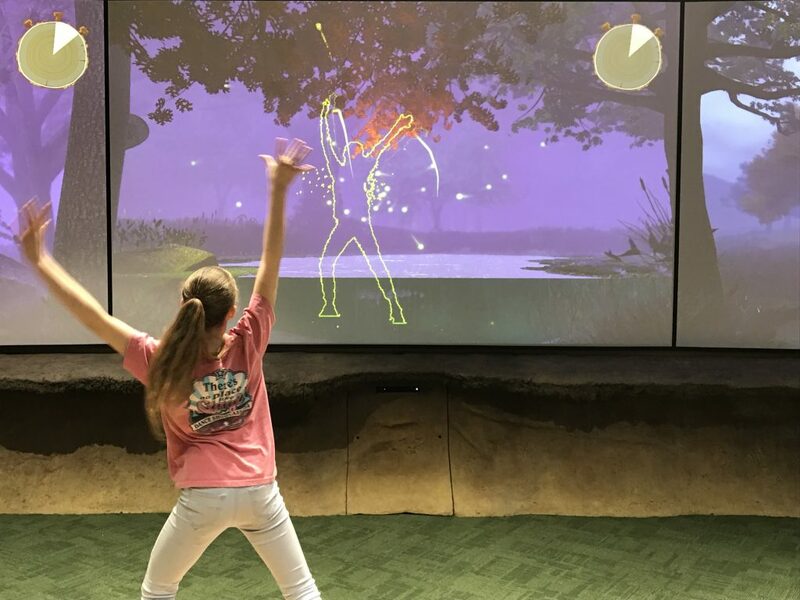 Check out the Fox 4 Lone Star Adventures feature on The River Legacy Discovery Room! This new space allows more opportunities to host meetings, weddings and traveling exhibits. A collapsible wall featuring vibrant graphics closes in our learning labs providing secure and private access for our field investigations and classes, but can be opened to expand the exhibit area when not in use. To sustain and maintain the integrity of the new exhibits, River Legacy Living Science Center now has an Annual Membership Benefits Plan that will allow guests unlimited access to the Discovery Room, as well as other perks, such as guest passes, pre-registration privileges, private events and free tickets to special events.